English verbs change ‘form’ depending on how they are used. For example, the verb ‘to watch‘ can be watch, watched, watches or watching, depending on the tense of the sentence. Because ‘to watch‘ is a regular verb, the past simple (verb 2) and past participle (verb 3) are the same. They are both simply the present simple form with -ed. Most verbs in English are regular, and follow this easy rule. So if you want to use a verb in the past tense, you can usually just add -ed to the end, and your sentence will be correct. However, the rule doesn’t cover all verbs. For example, if we use the verb ‘to write‘, there’s a big difference. Here, verb 2 and verb 3 don’t simply add -ed, but are new words. That’s because ‘to write’ is an irregular verb. Irregular verbs change form in different ways to regular verbs. 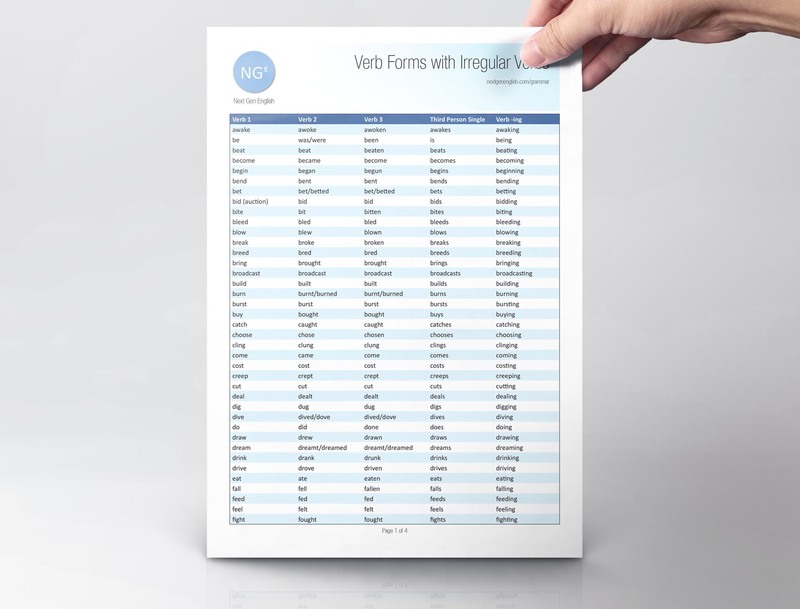 See below for a list of common irregular verbs.